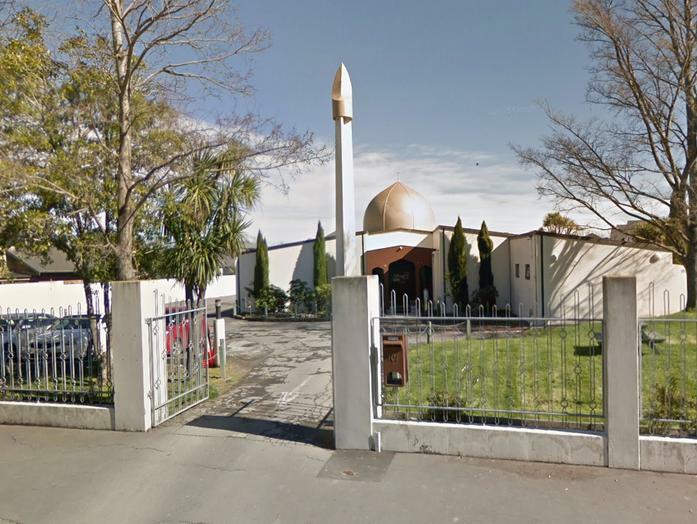 ‘On Friday, 15 March, 2019, between 1:40 pm (11.40am AEDT) and 5:27 pm NZ time two mosques were attacked each reportedly by a gunman in Christchurch, New Zealand, who was eventually arrested after having his car rammed by two police officers who had been attending an armed training-exercise when the call went out. We cannot nail a specific time the car was stopped or an exact location the officers made the arrest [Ed: A Daily Mail timeline now fixes it as 2:07 pm]. One of the two mosques targeted by the shooter was the Sunni Al Noor mosque and the other the Linwood Mosque. The mosques are situated roughly five km apart. The order in which the shooter(s) conducted his terror campaign is confusing as we have contradictory accounts of which was attacked first. 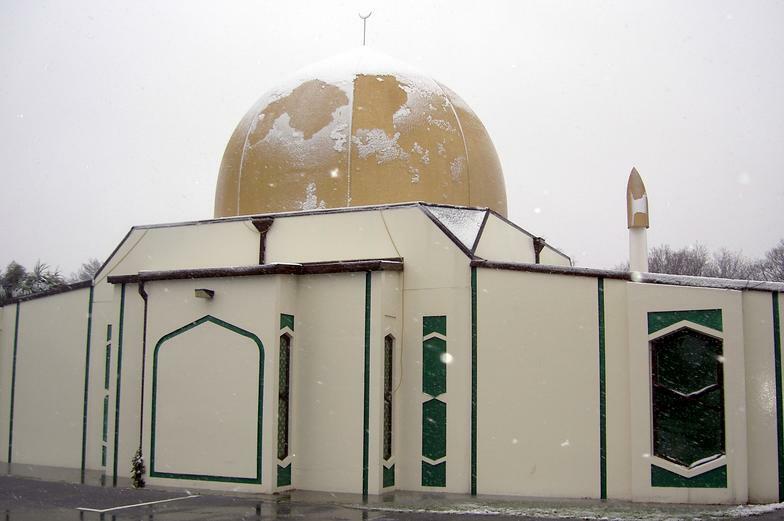 The BBC reported in its timeline of events that the initial attack was at the Linwood mosque. 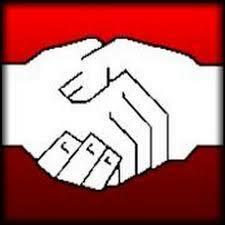 However, the majority of dispatches suggest that Linwood followed Al Noor. This appears to conflict with the story regarding the arrest by the two officers responding to the Linwood shooting (one of whom is surprisingly already now overseas as both have taken sudden leave) who, it is claimed headed towards Al Noor mosque along Brougham Street on a hunch that the gunman may target that house of worship next. This might be a temporal error understandable in the confusion, but scrutinizing the catalogue of reports both online and in The Australian the original shootings were at the Al Noor mosque, which is the version we shall accept since in the footage we’ve viewed Tarrant makes no mention of any earlier engagement nor does his disposition suggest that he has previously committed any ‘action’. Again, we’re unsure why he stopped live-streaming when he got to Linwood, however, that was possibly a technical glitch. The first-hand reports of an active gunman (we assume that all media sourced their approximate time of the incidents from local police since they’re all uniform in their order) begun at 1:40 pm. First police response is given at 2:11 pm without elucidation of what that “response” entailed. Fifty-seven minutes later there are reports of six-to-seven dead. At 3:45 pm, two-hours and five minutes later, there are further reports of a shooting. That is two hours in which the police have failed to locate the suspect(s), or prevent a further shooting, or, it would seem, do anything much at all except apparently answering the phone. By 4:01 pm there is “one” in custody, but no mention of the other three, as various agencies reported four arrests. It is, we presume, Tarrant who was arrested at this time. Which makes us wonder why one-hour and twenty-six mins later at 5:27 pm “first reports” of a second shooting is recorded at Linwood. 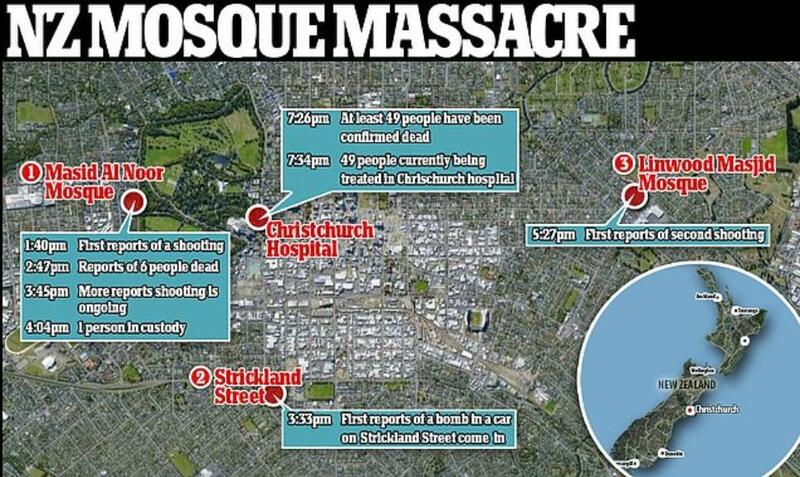 Meanwhile, two hours earlier at 3:33 pm there was an incident report of a bomb in a car on Strickland Street; a location that appears to bear no strategic relevance to either mosque. Regardless, according to this timeframe this lone gunman had three-hours and forty-seven minutes to do his thing and rock the world all in the short distance of five kilometres. Did he stop off for a beer or a pork knuckle at a nearby German restaurant? However, we will politely defer any cynicism that may be interpreted as contributing to a conspiratorial mindset and suggest that everything which was reported regarding times and locations were, for a myriad of reasons, not 100% reliable except for that which is seemingly undisputable: such as two mosques were targeted by a gunman who live-streamed his rampage from one of the mosques in a merciless, calculated killing spree. Places, times, and police responses don’t seem to accord with logic, but we’ll suppose it is all just human error of one sort or another. Not to mention lazy reporting by well-meaning but nonetheless useless media hacks. We do have accounts of terrified Moslem victims, and one “hero”, Abdul Aziz, 48, who provided unintended comic relief to an otherwise horrific situation by allegedly fending off the gunman with a credit card machine while facing him down at the Linwood mosque. We won’t inquire as to why there’s credit card machine in a place of worship suffice to say that its celebrants need to buy “stuff” and they’d rather suffer usury than pay cash. At one stage, Aziz picked up the gunman’s discarded rifle and took aim at the homicidal gunman. But when he pulled the trigger, he was left somewhat naked again as either the magazine was empty or he was clueless as to how to handle an automatic weapon. Still, he gets full marks for displaying testicular fortitude either way. 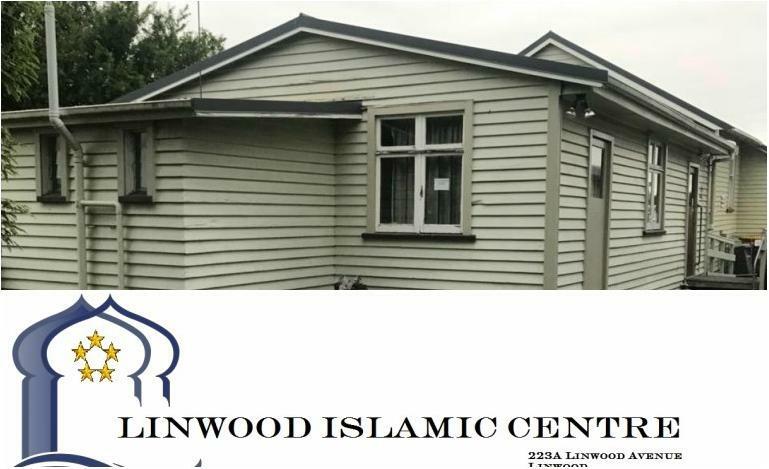 Another story from a plucky Mohammedan survivor recounts how at the Lindor mosque Sabir Hussain, an Indian immigrant from Fiji, was “doing a prayer when our imam said our brothers have been shot”. He crawled out the bathroom window where he encountered one dead outside. Despite the corpse, he “hid behind a fence before the police arrived”. This, of course, according to all accounts puts the police arrival at 5:27 pm, the great delay perhaps explainable by unusual queues impeding police progress to the counter of the nearby Doughnut King bakery. Similarly, fortunate enough to have survived the Al Noor massacre either before or after Linwood experienced the scorching lead of the Saxon crusader are the Bangladeshi cricket team; the cricketing world coming perilously close to an incalculable loss if the skittish sportsmen had not possessed such an innate instinct for self-preservation (except when it comes to winning matches). The 17 pious team members plus their manager were a mere “50 yards” from the Al Noor mosque when the firing began according to the ever-reliable BBC. All were “mentally affected” during the 15-minutes they spent on the bus observing what was, unbeknownst to them only a six-minute ordeal. After that, they all made the wise and life-affirming decision to join those teammates who’d already taken to their feet and bolted like buggery through the park. All up, if the reporting is accurate, and let’s face it, so far, it’s been anything but, just to recap, the shivering sub-continentals hung around for 15 minutes on the coach (which is nowhere to be seen in the crowded car park filmed in the shooter’s video) — long enough to subject themselves to unimaginable trauma and probable lifelong PTSD — before deciding not to be heroes and sensibly leg-it instead. We’re sure there are just as many other inspiring tales of human survival and desperate witness accounts but at this stage our writer has decided to stick with something less muddled than what the mainstream media has offered and report on the video, which, if it wasn’t staged in a Hollywood film lot somewhere with the ghost of Stanley Kubrick directing, at least tenders a small degree of certainty regarding facts we put down. And we do, dear readers, emphasise the word “if”; although far be it from us to be sceptical. Note: The only media we could find that has updated the ‘timeline’ to a credible track of events was in The Daily Mail underneath an article titled ‘Accused Australian Terrorist Stormed the Mosque from the Wrong Side’. 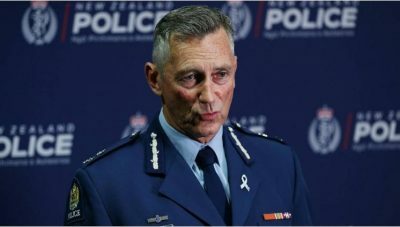 Nevertheless, key details, such as whereabouts the two officers, now mysteriously on leave, encountered Tarrant’s vehicle; nor indeed why his spree went unchecked so long, are unanswered. This article is a bit of a loner in that once it’s veered off its ‘heroic’ victim subject it highlights that the shooter was essential of a fractured mind, which isn’t the narrative that the mainstream media wants to be adopted. We haven’t seen the timeline updated anywhere else, but here it places both shootings in the credible range of 35 mins all up from Al Noor on Deans Ave to Linwood, which accords with our estimates after gone through the video frame by frame and traced the killer’s route via Google Street View.